You will need to install BlueNote Lights on all of your computers where you need communications. You can do this over time as you become more familiar with BlueNote if you only want to install it on a few computers at first. Also, since BlueNote does not have any server components you can start the installation on any computer you would like. The second is Conversations; this is used for direct, one-on-one communications with one or more staff members. Customization. At some point you will want to customize BlueNote to fit the needs of your practice. 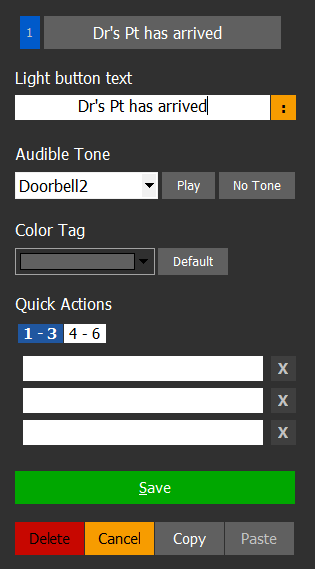 From BlueNote, click Menu then select Options. Select Advanced and then choose System Wide Changes. When prompted, type in the word configure. 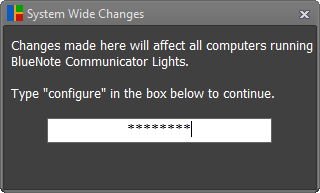 You are now in the System Wide Changes Editor. From here you can customize BlueNote to fit the needs of your practice. Save your changes, or as we call it, Publish. When you are done making changes you need to send these changes to all of the other BlueNote clients. To do this, select the Publish tab and then choose Publish. Tip: If you want to keep all computers updated with any changes you may make, click the; Keep all clients updated; button at the top of the publish screen. It’s extremely likely that the default settings of BlueNote Communicator aren’t all appropriate for your practice, and that you’ll want to change many of them as soon as you’ve figured out how the software works and what it can do for you. Do you need Lights to call doctors to treatment rooms? Maybe a few Lights to announce patient arrivals? What about specific tasks? Do those need lights as well? Think about all the needs you have for staff members who move around your office frequently, and then you can begin designing your customized light panel. 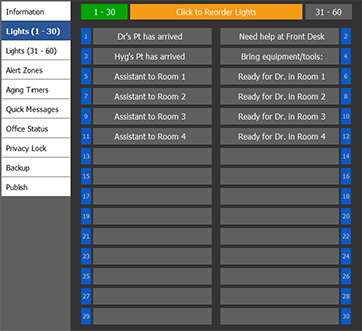 The text of each light, as well as its individual tone, and even the timers and quick messages can be changed to suit your style and needs, but these changes need to affect every computer in the practice to promote uniformity and prevent confusion. In other words, all Lights are in the exact same formation and play the same tones, and change color at the same times, regardless of their location in the practice. Because System Wide Changes are permanent and affect all computers, they have been placed within the Options menu in a manner that keeps them from being accidentally altered. 3. Since any BlueNote client can make changes we are confirming the user understands that these changes will affect all computers. 4. 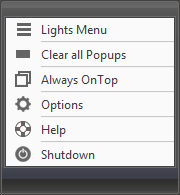 If you are wanting to add, change or delete Lights, then select Lights (1-30) for the first tab or Lights (31-60) for the second tab of Lights. Each tab can have up to 30 Lights for a total capacity of 60 Lights. Click on the Light you want to add, change or delete. 6. Save your changes, or as we call it, Publish. 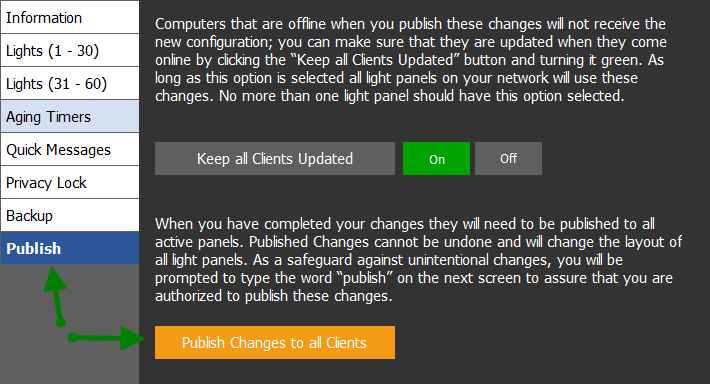 When you are done making changes you need to send these changes to all of the other BlueNote clients. To do this, select the Publish tab and then choose Publish. Tip: If you want to keep all BlueNote clients updated with any changes you may make, turn on Keep all clients updated at the top of the publish screen. If this options is selected then this client will need to be online anytime changes are published.